Two big famous monsters in My Little Pony that no one has calced yet (at least as far as I can tell). This is gonna be fun. Here's how this is gonna work: I'm going to find the length of the Ursa Minor's head, and it's snout. I will compare the length of it's snout to that of a Kodiak bear, and then use the square cube law to cube the size difference, and multiply by a Kodiak's average weight. I'll do the same to find the weight of the Ursa Major. First, to find the size of the Minor, I need something to compare it to, like a pony. Luckily I can do exactly that. First off: The height of ponies. 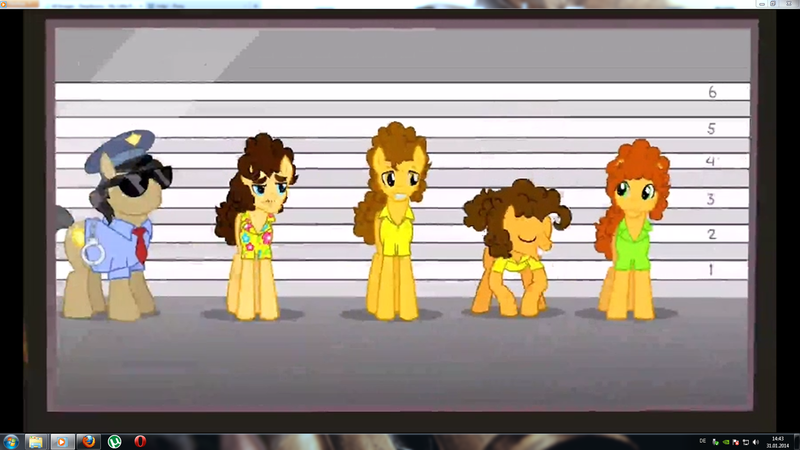 https://derpicdn.net/img/2014/1/31/539446/large.png This is a size chart with Cheese Sandwich and other ponies in front of it. The taller ponies are around 4 ft tall (they seem to use the imperial system) from the very base of their ears. I'm going to use the smaller pony as the height of a mare. Now while it's true the smaller pony is probably a stallion, but the tips of this small stallions ears reach the base of the ears of a normal stallion next to him. Whenever we see a mare and stallion side by side, the mare's ear tips also reach the base of the stallions ears, so I think this is a safe assumption. I started from where the ear meets the head and went from there. The smaller pony was difficult since their head was obscured by their mane but I found a rough estimate. Twilight stands at 70 pixels, but I need to take into account that she is standing at an angle. Accounting for the angle, the height becomes 80. The snout is 48 pixels, and the head is 242 pixels. Scales to Twilight for lifting the thing. I could establish the newtons needed to lift it against gravity, but I'm a lazy boi. Now for the Major calc (shutting up now). We've established a head height of 3.541 meters for the Ursa Minor, now we'll find out how big the snout of it's mother is in comparison. Ursa Major's nose is 45 pixels and the Ursa Minor's head is 34 pixels. Talk about massive. How the hell is something so heavy even alive? Scales to Rockhoof for tossing the thing and anyone remotely comparable to him (Lol, Rarity lifted more weight in clouds than this fraud). I could again, get something based on how high he tossed it, but I'm too lazy (plus I don't know any good time-frames or speeds). Rockhoof did WHAT to an Ursa Major? When did that happen? According to one of Rockhoof's tales he fought with one. And tossed it high into the sky, and from what he's been told, high enough to become an actual constellation. So he tossed a small skyscraper sized beast into the atmosphere where it (somehow) became a constellation? Gotta admit, after the hype the Ursa Major got in Season 1. I was kind of hoping it would be a little more impressive, like at least adult dragon tier. Still have to lol at Season 7 "Ponies can't outfight dragons" only for the scene to end with them doing exactly that. The Ponies sell themselves way too damn short. @Neruc Probably, she's at least superior to fodder pegasi who can push together a Manehattan sized storm together in seconds. I've already gotten 4.14e10 kg per pegasi from that, and if I found the Newtonian energy it'd be even higher. Considering how often pegasi are implied to do that, we have consistency.